Gorstella Gallery was established in November 1990 by Peter and Klazien Bullivant, with the ongoing objective of bringing high quality, original, affordable British art to the North West. The gallery is now run by their daughter Bridget and her husband Stephen. The space was created from some converted cow shippons adjoining their home in Dodleston, 5 miles from the centre of historic Chester. Gorstella Gallery currently has two exhibitions a year in May and November and is only open when an Exhibition is current, and the present format is for there to be a Private View on a Thursday and Friday evening, with the Exhibition continuing over the following two weekends. Artists include both established names and emerging local talent. 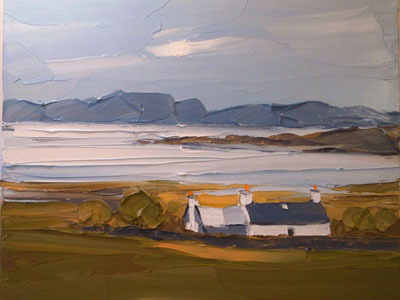 Artists that have exhibited include the late Sir Kyffin Williams RA, and the late Donald McIntyre, Pamela Kay RWS, Victoria Crowe OBE, Jenny Wheatley RWS, James Bartholomew, Andrew Hood, Jonathan Cramp RWS, Annie Williams RWS and Matthew Snowden. In addition, some 30 other Members of the RWS and RCA have exhibited. Each Exhibition displays a wide variety of styles and subject matter, so that hopefully every visitor will find something to his or her taste. Gorstella Gallery is anxious to spread the range of artists exhibiting, whilst at the same time, maintaining the policy of showing high quality work that would not be readily available to customers without travelling some distance.